My 560SEC came with a set of aftermarket wheels from Simmons. The Simmons wheels are a locally made wheel, and this set are two piece 16″ variants. They are shod with 245mm tyres so the fronts rub on sweeping corners and the backs on higher speed bumps. I prefer a more stock look so the plan is to remove and sell the Simmons wheels. My ideal would be to get a copy of the 15″ Fuchs wheels for the 450SLC and then use the 16″ wheels that are currently on the SLC on the new SEC. These wheels were bought originally for the 1988 560SEC I used to own. They rub slightly on the SLC when on full lock. The fuchs wheels are prohibitively expensive so not a real option at this point. 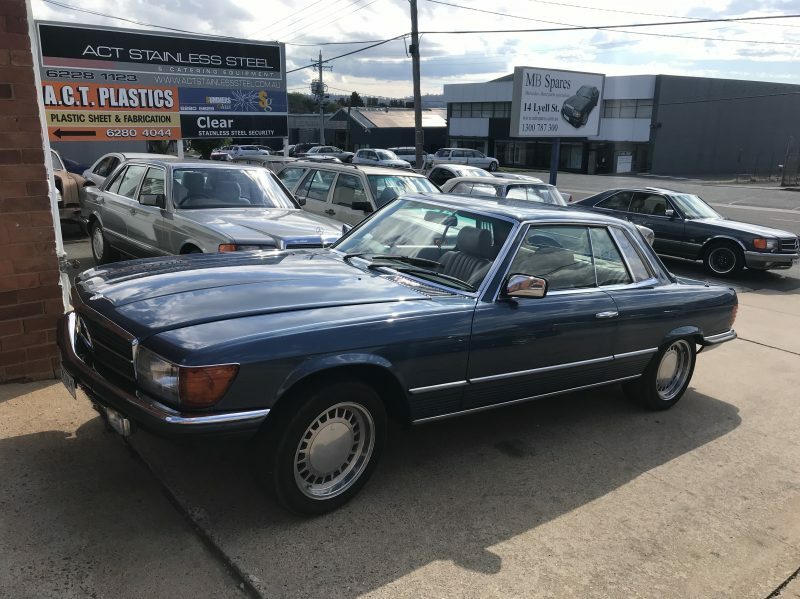 As it happens, MB Spares had a 420SEL in for wrecking that had hit a Kangaroo. The wheels had good tyres on them and had been refinished in the near recent past. This included the spare that has an unused tyre. These wheels look really good and I am very happy with them. They also came with the original lug bolts that are NLA from Mercedes. These have an extension that allow them to be flush with the wheel face. These wheels are the same as would have been fitted new on the 560SEC, other than the 560 has slightly wider tyres. They are also the same wheels that were optional on my 300SE, although that car was not originally ordered with alloys. Even though the wheels are standard for the 560, my plan is to fit them to the 450SLC, as they will fit better and fit the 450SLC wheels to the 560. 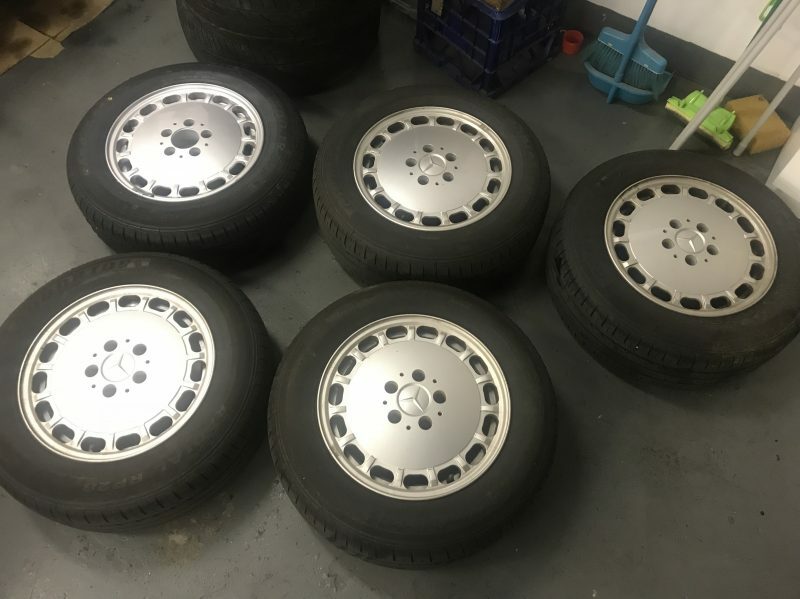 The 16″ wheels have 225mm tyres and work better on the W126. The W126 has a very big boot. 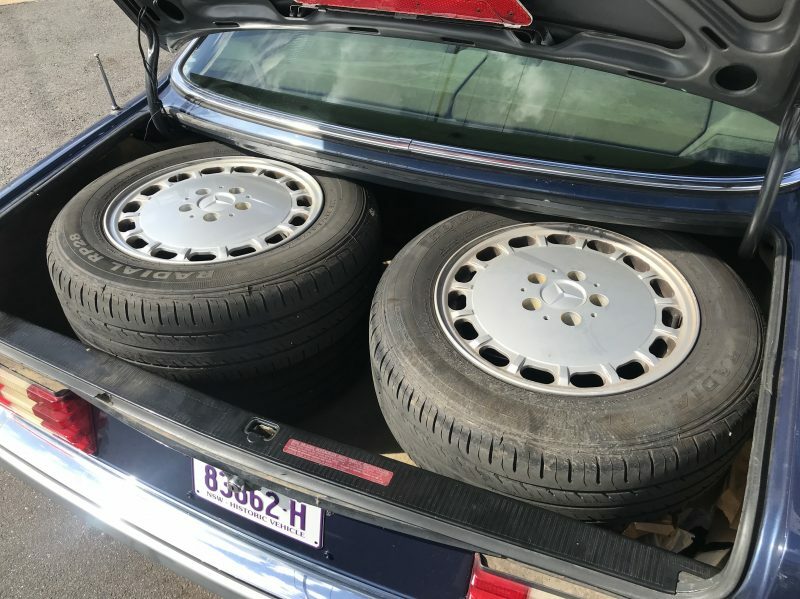 It is actually possible to fit all five wheels in the boot if the spare tyre is removed. This was a slight risk driving down to Canberra with no spare tyre, but at least on the way back I had 5 spares! While I was at MB Spares I saw two lovely cars parked out front. Firstly a 450SLC in a very similar colour to my SEC. It is in very nice condition indeed. That car is fitted with the ‘Centra’ after-market wheels that are now desirable and hard to find. It also had a very nice interior. 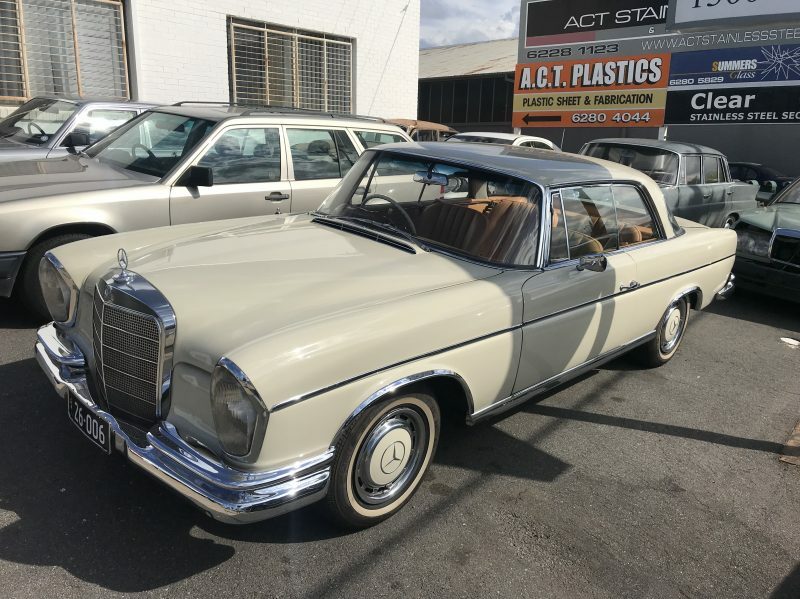 The other was a W112 300SE Coupe. The car was a cream colour with an immaculate interior complete with Safari Seats. I’ve not seen this colour before in the flesh – it’s much darker than the normal Ivory colour that was popular at the time. The 560SEC performed well on the road trip to Canberra. It has plenty of power on the open road and is a comfortable cruising car. The only negatives were the wheel wobble that will hopefully be cured when I remove the Simmons wheels, and the lack of A/C. The fuel consumption with the 450SLC is also interesting. The SLC can get to Canberra and 1/4 of the way back before it needs refueling. The SEC can get down to Canberra and 3/4 of the way back before it needs refueling. Both cars have 90L fuel tanks. On the freeway portion, I got 12.5l/100km for the 560SEC, not bad for a 30 year old car with a 5.5l v8. Bryce, something about THAT Crème colour – except the Crème on the Rover Mark III is more “creamy” than this 300SE. …….can’t get away from Crème !